The Buckinghamshire Millennium Clock was installed in the County Museum, Aylesbury, in 2000. 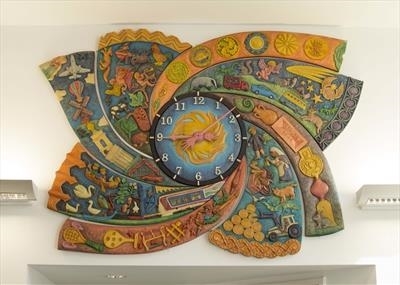 Commissioned by NADFAS, the relief carved artwork consists of eight spiral segments rotating around a large carved clock face, depicting familiar landmarks and objects, quirky local history, tools and craft skills, familiar flora and fauna, and aspects of contemporary life. Carved on lime, painted with watercolour, finished with fire retardant lacquer. I spent several weeks exploring the local history of Buckinghamshire, visiting places all over the county, from Newport Pagnell and Bletchley to Chesham and Marlow, browsing public library local history archives, and picking out quirky details such as the story of the Dinton Hermit, whose much patched shoe is displayed in the Ashmolean Museum. The clock mechanism is supplied by Smiths of Derby. Photographed on 25 June 2015, the artwork has aged well since installation in 2000, maintaining its original colour, and showing some signs of shrinkage.